There are few flowers on Earth that rival the beauty of Passiflora spp. (Passion flower), and, perhaps, no fruit more symbolic of the tropics than the Passion fruit. However, the temperate climate of the United States is home to a native species of the passion fruit, Passiflora incarnata, and its unique anatomical features symbolize far more than a tropical region of the Earth. So brilliant is the beauty of the Passion flower that it has come to symbolize the divinity of Christian salvation history. And while it's fruit may be delicious, it's medicinal qualities are continuously being substantiated through the rigors of scientific testing. Welcome to the glorious world of Passiflora incarnata. In North American forest edges, along fences, an in thickets . The young shoots and leaves were added to other greens and eaten by the CHEROKEE after boiling and frying them . The fruit can be eaten raw, made into jams, juiced, or eaten like a tiny passion fruit. The CHEROKEE made extensive use of P. incarnata: an infusion of the roots was used to treat boils, earaches, promote liver health and to aid in weaning babies; the roots were pounded and applied to wounds to relieve inflammation . The HOUMA used the roots in an infusion as a blood tonic . 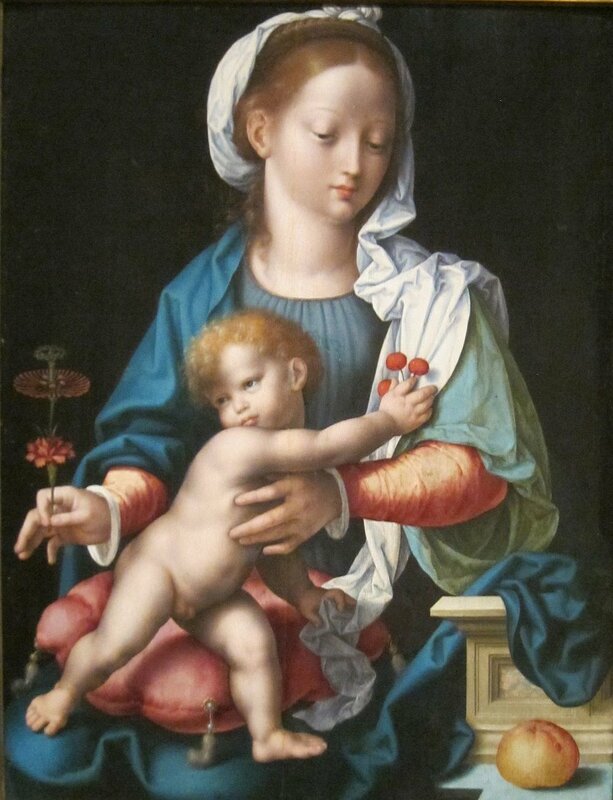 Madonna and Child, by Joos Van Cleeve, 1530-1535. In the above image of the Virgin Mary and The Christ Child, you will notice the Passion flower in the right hand of Mary. The anatomy of the Passion flower has been used to convey Christian Salvation history since the late 16th century . The slideshow below takes you through the Christian interpretation of the flower anatomy of P. incarnata. Where the Passion flower presents with four styles, I believe this is to be taken as a direct symbol of the cross. There have been a surprising amount of serious scientific studies dedicated to the efficacy of P. incarnata as a therapeutic agent. Butanolic extracts of the flower of P. incarnata have recently shown promise in improving cognition and improving the health of those with Parkinson's disease and dementia . Further, sedative effects were seen with a P. incarnata extract on patients soon to undergo spinal surgery; this sedation appeared to have no impairment of locomotor function . This anxiety-lessening effect was seen in other studies testing the efficacy of patent drugs made from P. incarnata . A methanol extract of P. incarnata showed promising effects in reversing opioid addiction . The same methanol extract of P. incarnata seems to have addiction reversal qualities toward nicotine as well . not to cultivate the maypop, one cannot imagine." Studies have shown that light has an inhibitory effect on P. incarnata seed germination and that an optimal set germination temperature should be held at around 35 °C (95°F).